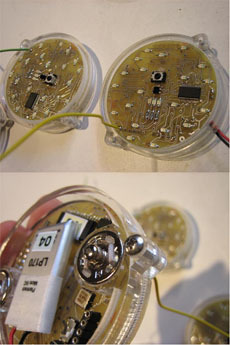 The Octopus modules are compact, body-worn displays that support a range of possible interactions. Several devices – approx. 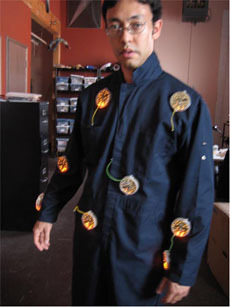 5 to 15 – are affixed to a person, using magnetic snaps that can be attached and rearranged on a reconfigurable garment substrate. 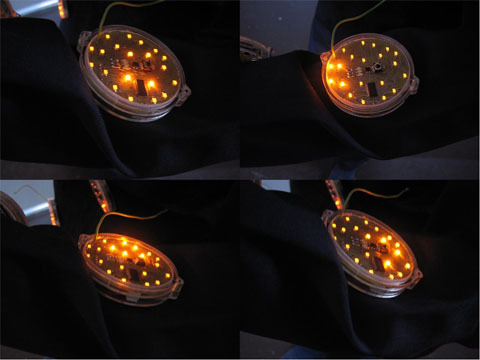 Each palm-sized device has a 20-LED display and a flash-programmable microcontroller. Each has its own rechargeable battery, so the garment need not carry power or data wires. 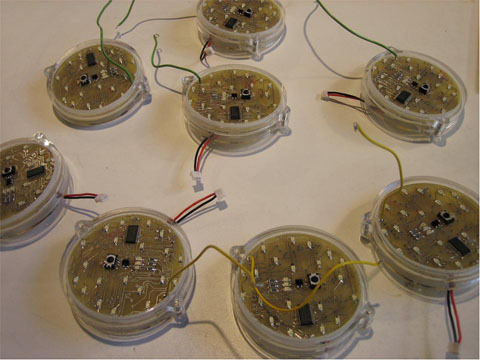 The devices communicate with each other and detect movement. While the Feathery Dresses and Intimate Memory garment allowed explorations of intimacy and interactivity, their physical configuration was fixed as components were embroidered, stitched, or woven directly into the garments. To allow more flexibility in our investigations, we developed the “Octopus” modules. The hardware and firmware are designed and implemented by Blackdust Design. 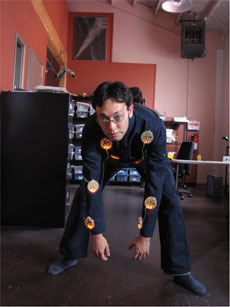 - Body movement: an accelerometer detects shaking and tilting; thus simple changes in posture or gait can be detected. - Contact: a capacitive sensor and an IR reflectance sensor detect the contact of hands or objects with the front surface. - Communications: the devices can interact over line-of-sight using an IR remote control protocol. - “Movement representation”: visualizing the movement and acceleration of the body over time and through space.